Most successful marketing campaigns don’t just happen by accident. They require time, attention, and most importantly – planning. Unfortunately, many business owners take a more haphazard approach, piecing together various strategies, then hoping for the best. While no two successful content marketing campaigns are exactly alike, most campaigns contain a fairly predictable set of characteristics. This post will outline 5 key components that will give you the best chance of achieving content marketing success. Before you write any content, craft an offer or even think about your marketing funnel, you first need to decide exactlywho you’re marketing to. This key step will build the foundation of your content marketing campaign for your business. It will ensure making sure everything you do is geared toward your ideal customer or client. 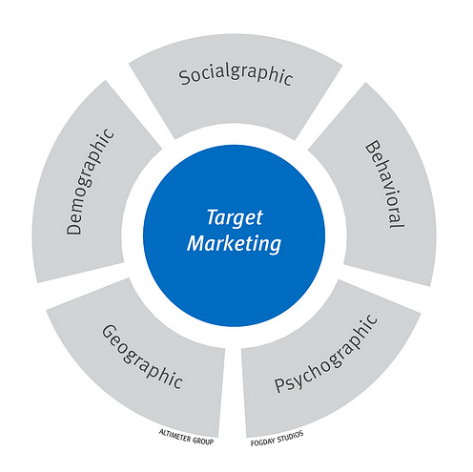 As this graphic from the Altimeter Group shows, there are a variety of elements you should consider. These considerations include the demographic (e.g., age, gender, etc. ), psychographic (e.g., personality, lifestyle, etc. ), geographic (e.g., city, country, etc. ), among others. What is the problem my product or service is trying to solve? Who is most likely to have this problem? Will these people actually pay me for my offering? If not, you may need to revise or update your offering completely. You can also consult your analytics to see who is already visiting your site and buying your stuff. Use custom reporting in Google analytics to learn exactly who is converting; you can even learn detailed information about these customers including age, what types of products they’re likely to buy (in-market segments) and interests and lifestyle (affinity categories). Once you’ve clearly defined your audience, you can begin creating your content. This could be written content (e.g., a blog or social media post, a report, a press release, etc. ), an image (e.g., a meme, infographic, etc.) or a video. Keep your target audience in mind as you write/create (especially the title as this is what will get them to click) – as well as mentioning the exact problem and the primary issue your product solves for them. Many business struggle with this step of the process, wondering what they should be writing about. They know they need to find topics that are extremely relevant to their target market, but don’t know how to consistently find these topics. My post, A 4-Step Formula For Finding Killer Content Ideas should help with this. Keep in mind that your content shouldn’t be promotional. Unlike an ad, your business, products and services shouldn’t be the star of the show. The issue you’ve addressed in #1 will be the theme of your content, along with how your product or services addresses that need. In some cases you may determine not to even mention your business at this stage at all; for instance, when writing a blog post. You save the mentioning of your product in the next steps of your campaign. While your content may not promote your business, your offer will. Keep in mind your offer often isn’t a hard sale; in fact, it’s often completely free, and meant to capture emails, not to make immediate sales. First and foremost, your offer should be something that’s very valuable to your target audience, and that they can’t get anywhere else. This could be an ebook, white paper, report, case study, free consultation, etc. Again, the offer won’t usually be a direct selling tool, but a way to showcase your expertise and help your customers get to know you. Need additional help with content marketing? Click below, we can help!